So for a few weeks I have been looking at a range of different topics to write about. One place I have always wanted to visit was Stone Henge, so I decided to have a road trip out to Wiltshire to find out the mysteries that surround this fantastic monument. I expected to come back to write about Ley lines and the history surrounding this but while visiting found myself researching about crop circles from the internet and books. I will stress I am not expert in UFOs but the paranormal field isn’t just about ghosts and ghouls, it is all things paranormal (anything that is a mystery, unexplained which isn’t normal) , but even crop circles have been linked to spirits, something I will touch on further on in the article. Why crop circles?, well after researching into Stone Henge, I came across many sites that connected recent and previous crop circles to this location and was fascinated at the fact that a lot of the reported crop circles are indeed reported in Wiltshire. 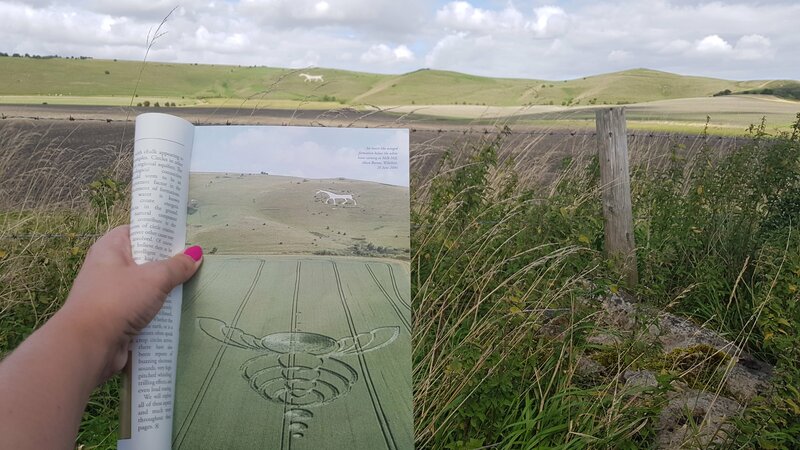 Crop circles have been reported outside this area of course, but Wiltshire tends to be the main hotspot for them. Many people will think that crop circles are some kind of hoax, many may believe that it is the farmers way of drawing attention to their farm, but after researching into this, farmers are less than impressed when these things pop up in their field over night and due to attention they get, the farmer ends up at a massive loss in profit, sometimes a huge loss of up to 120, 000. Some farmers will allow you access to view these circles, but looking into it, a lot don’t and a lot just do not want the attention they get, as it can result in further damage to their crop fields. The ones that do allow you to view, may put a donation box outside the field, in order for you to view, but this is at a cost of £2 and this still would not add up to what profit they would have made if they had sold the crops after harvesting. Crop Circles are still widely considered to be one of the world’s biggest paranormal hoaxes since 1991, when hoaxes Doug Bower and David Chorley were filmed showing how they made many that had been discovered across the UK. This however, didn’t stop people believing though and has in anything paranormal people will fake… and the actual formations from these guys was nothing spectacular and the quality of them was poor compared to all the other formations. Many believed this was a deliberate distraction to dilute the interest in the real phenomenon that was and is taking place. My thoughts are people will fake, in what ever area within the paranormal you are interested in, fakes will always be reported but it doesn’t necessary mean they are all fake and it didn’t stop crop circles being formed, in fact this year, the increase in reported crop circles have increased within Wiltshire, police put out an official statement saying that it is a criminal offence to form a crop circle and anyone caught will be prosecuted but as up to yet No body has been caught creating these formations this year or previous years apart from the two named above. I also find it extremely interesting that surrounded around Wiltshire and Stone Henge, there are many military bases, on my travels I seen at least 3 all located with 10 mile range of Stone Henge, why is this interesting? Well this topic may be an area I need to touch up on in another article but in my opinion where there Is heightened UFO activity there tends to be a lot of government bodied areas for example look at area 51 in America and the UFO activity reported there. So what are Crop Circles? Unlike many other mysterious phenomenon such as ghosts, psychic powers or Bigfoot, there is no doubt that crop circles do exist and are very real. The question is what creates them? THERE are many theories and explanations ranging from Aliens making patterns themselves, their space ships creating an energy to form them, precise wind patterns, time travellers, scientifically undetectable earth energy fields and meridians called Ley lines, spirits (ghosts), humans and even horny hedgehogs lol. It is very rare that a crop circle will contain squares, triangles or rectangles, but some may have straight or curved lines. Sceptics of these circles would suggest that a circle is the most easiest for a hoaxers to do. – Mostly have been formed overnight. Again sceptics would say that is the best time for a hoaxer to do these to not be seen, but I would have to argue that it would be extremely difficult to create these in pitch black conditions and given the fine details of them, surely it would make it extremely difficult. Even though, some have been reported during daylight hours it is very rare. – usually appear in a field that has easy access to the public. It’s very rare that one will appear in a remote field. 21st August 2017 is the day the USA will experience a total eclipse. In the south of England, people will experience a partial eclipse. Many people believe that crop circles have been reported for centuries. Farmers have mentioned throughout the years strange shapes appearing in their fields but due to the fear or supersaturation these was not reported. The first piece of evidence of this was a woodcut In 1968 in Hertfordshire, which appeared to show a field of oat stalks laid out in a circle. The pamphlet tells of a farmer who refused to pay the price demanded by a labourer to mow his field. The farmer swore that he would rather that the devil mowed it himself. Some researchers would say that this isn’t the first ever account has the pattern in which it was made is different but many do think it is. The first photograph of a crop circle was in 1932 at Bow Hill, near Chichester, West Sussex. A large proportion of these crop circles appear more regularly in or around an area that has become known as the ‘Wessex Triangle’ with its main cardinal points around Silbury Hill, Warminster and Winchester. The triangle boosts the presence of two of the largest stone circles Avebury and Stonehenge. The whole region is surrounded in burial grounds. Many being circular. Silbury Hill is also circular and is the largest man-made earth work in Europe. It’s source and purpose is a complete mystery like the crop circles themselves that cluster themselves around it as a precise centrepiece for them. Below is the area I visited at Milk Hill, Alton Barnes, where the white horse craving is situated. There has been many crop circles appear in this area in the fields and some people even reporting seeing balls of lights and strange occurrences in this area. Below is some footage I have found by a you tube channel, Temporary templates..
As you see in the picture from the book I have, this circle would sit in the field i am in front of, where a formation of a winged insect was formed on the 26th June 2014. ENTERING A crop circle can be an exciting, hypnotic and a mysterious experience. Of course it doesn’t come without a warning. For those who have entered, some have reported experiencing many physical and mental effects. This has been dependant on the pattern of the formation and the individual. Feelings can range from elation, peacefulness to nausea, headaches, disorientation and panic. Some people have reported electrical tingles and other strange sensations.. Miracles and healings have also been reported but also sudden declines in well-being, as well as menstrual cycles being disrupted. Animals have been known to act strangely in and around crop circles. Livestock and local dogs have been reported to have acted wildly in fields or houses near new formations. Electronic equipment, for example, seems to malfunction when taken inside a formation. There has been regular reports of mobile phone batteries draining and cameras failing. There has also been reports that compasses and other magnetic devices have had strange effects on them. Farmers have also reported that combine harvesters have broken down when attempting to cut the crops. Pictured below is a crop circle that was reported on 7th July 1996. This is known as the ‘Julia Set’ and is 915 feet long and consisting of 151 circles. This was formed during day light hours and believed to have been created in a 45 minute slot. In full view of stone Henge, in front of the road the A303, with nobody reporting to have seen someone doing it. OLIVER’S CASTLE – 7 second Formation – 1996 . The footage was taken near an ancient hill fort of Oliver’s Castle, near Devizes, Wiltshire. This footage as split researchers to whether is was an elaborate stunt or genuine proof. It still has many researchers convinced it is in fact genuine despite an admission it was a hoax. THERE is a donation box if you wish to visit, it’s not so easy to find, the farmer as not drew attention to it being there, but the reason she has opened it up is because people who have been interested have visited in their 100’s and have unfortunately damaged some of her other crops trespassing. Unfortunate for me, the farmer had harvest the remaining crop so the depth of the circle wasn’t so clear. On my pictures you can still see the outline where it was and upon looking at this crop circle and the previous one I had visited in Wiltshire they appeared to have similar characters. Both had like a weaved effect to them, like a blanket would, rather than just a flattened effect. This one, however, had like weaved swirls as you can see in my second picture and I would guess it would have taken some time to do this. Feelings while being in this circle was disorientation, feelings that everything appeared closer then it was. I HAVE included an over head video I have found on YouTube by Matthew Williams, for you to have a better look. Previous post: The famous haunted doll? attacks again and spooks news reporter? ?